Apparently, it seems as though a respectable amount of time has passed since Ophra has moved onto the "Next Chapter". I say this because I have noticed that afternoon TV programming is now being inundated with "new" talk sows. 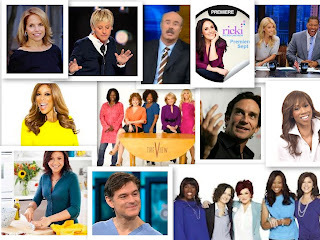 Of course when Oprah was queen of daytime talk, she had her share of those who tried, unsuccessfully, to dethrone her. Her only real competition was Ellen Degeneres. Oprha spawned a few protégés, with the caveat that their shows would absolutely not air at the same time that her's did. At least I am fairly certain that she must have made that stipulation. Currently, in addition to Rachel Ray, Dr. Phil and Dr. Oz, three of Oprah's OWN, and old standbys such as "Live with Kelly and (new co-host) Michael Strahan, the View and the View's clear ripoff "The Talk", we now also have "Katie"(Couric), Jeff Probst, Riki Lake, Steve Harvey, Trisha Goddard, and Wendy Williams. Sorry if I have left anyone out. I was a big fan of Oprah's. I have to admit I haven't watched her new network. I can never find it and the programming is sketchy, to say the least. Besides none of the shows on OWN are "Oprah". I decided to give two of the newbies a try. At first I thought Jeff Probst's show was unique. The format was a little different. The show seemed to be a spontaneous studio audience participation show. During the show, Jeff would pose a question. Like, uh, for instance "how many of you here have ever blah blah blah?" Hands would go up and Jeff would run into the audience with a mike. Okay, it took me about three shows before I realized that the whole thing was scripted. The audience members who seemingly were picked at random were in fact picked prior to the taping of the show. The whole bit of Jeff running into the audience with a microphone was clearly an illusion as it soon became obvious to me that the "random" audience member had already been fitted with their own mike. The "Katie" Couric show seems to be more of the caliber of Oprah. That is more like Oprha before she started to go over the top with car give-a-ways. Katie is much more low key. The studio audience sits very close to the stage and Katie is within a hand shake away from the front row. She has interviewed some interesting guests. The shows are varied in tone, ranging from light hearted to heart breaking. One of her shows took place right in her apartment, with the studio audience as her guests. I found that to be entertaining. Recently a topic on one of Katie's shows was "What Happens When We Die?" This particular subject and the way it was treated on the show fascinated and touched me. So much so, that it deserves its own post. So, I DVR "The View, "The Talk", Dr. Phil, Jeff Probst, and Katie. In the evening, instead of watching the local news, which by the way is filled with fires, murders, and traffic jams, I will skim through the DVR'd shows to see what the topic of the day is. I usually wind up pressing delete, delete, delete, without even watching a single one. I definitely would much rather watch a "Law and Order" marathon any day. Still feel ill but not as bad. Took a ride with Junior. Went to Bambs and bought a bird for him. He just loves it and doesn't leave him a lone a minute. Went to 360 for lunch. Left Junior there and went with Mary to visit Christine. Home for supper. Jewel and Rick came. Played bridge. Bed early. Junior not well. Temperature, upset stomach and pains. Dr. came and prescribed. Up until 1 a.m. to give powders every 20 minutes. Then slept together. I used to love to watch Oprah back in the day. I don't watch the others as much. Usually busy with other stuff. Brilliant post bringing me up to speed on all I am missing. The afternoon talk shows have always been on when I was still at work so I rarely watched them. I do remember watching some of Oprah's when I knew ahead of time that some special guest was going to be on. The way you describe that one show "Jeff" makes me want to avoid it big time. Scripted and not real. COmmercials ruin those talk shows anyway for me -- sound bits and ugh.